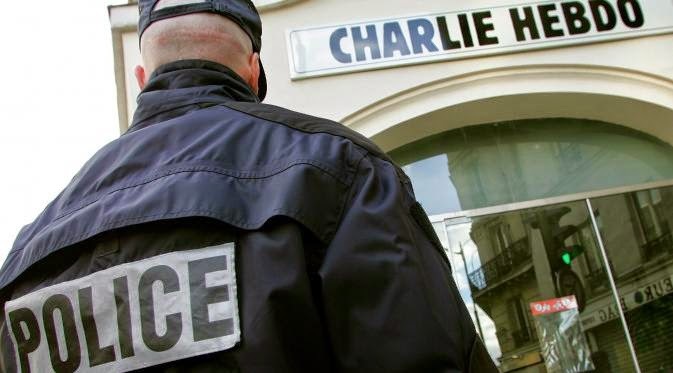 PortalZine - Terrorist acts occur in the office of the French magazine Charlie Hebdo in Paris. As a result, as many as 12 people were killed, including two policemen. The authorities are now pursuing three actors who fled by car. As published by the BBC on Wednesday (07/01/2015), the actors wore masks began firing at the office of the magazine. The police are coming. Firefight ensued between the actors and forces. All three attackers then out of the office and shooting at people passing outside the media office. Charlie Hebdo is known often sparked controversy with their article or cartoon satire or sarcastic tone of political and spiritual leader. The media had published caricatures of the Prophet Mohammed. Their last tweet quip Abu Bakr al-Baghdadi, the leader of ISIS - rampant militant groups in Syria and Iraq. Reports say, 10 staff Charlie Hebdo were killed instantly in the attack. Sources close to the magazine said they were killed, including one of the founders of the media Jean "Cabu" Unplug and chief editor Stephane "Charb" Charbonnier. President of France, Francois Hollande condemned the incident. "An indescribable barbarity words just done today in France,"
"Steps have been taken to find those responsible, officials will hunt them, capture, and drag them to court." A police official said the gunmen fled to the east suburbs of Paris with a car. Earlier in 2014, France strengthen anti-terrorism laws and prepare for potential attacks in retaliation for a military raid into a militant stronghold in the Middle East and Africa. Not clear who the perpetrators of such atrocities. Hassen Chalghoumi, imam at the mosque Drancy in Seine-Saint-Denis Paris, also condemned it. "I'm very angry. They are criminals, barbarians," he said. "This is not an expression of freedom, not Islam. I hope France unite to end this cruelty." Until this news was revealed, there has been no claim of responsibility. The police are still pursuing the perpetrators fled the scene. French Foreign Minister Bernard Cazeneuve said, "Three gunmen involved in the terror attacks to Charlie Hebdo magazine office." France has now set the highest security level following an incident this terror. See the video at this link.